This is my sort of book. Love the black/white and orange colours of the cover. That cover sure is striking! Happy reading! Sounds good. I like to start at the beginning and read a series in order too. This week I have an urban fantasy – Midnight Curse by Melissa F. Olson. Happy reading! Peter Robinson…no problem. I would grab one of his books any time. The Inspector Banks books are new to me, but I like the little bit I see here. Yes, I’d like to read more. Sounds like a gripping read! Happy weekend! This is a good ‘un, in my opinion. It is a little slow to start, but the case is a really interesting one. 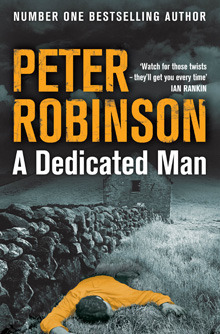 And I like the way Robinson develops the characters. I hope you’ll enjoy it, Margaret; I know I did. I have read one book by him and enjoyed it. I sure like the crisp writing and enjoy a new mystery series. Don’t you love it when you can start one knowing the other books are published and you don’t have to wait!